The GIA recently wrote “Of the millions of diamonds mined each year, only .001 percent can qualify as fancy colors and only a handful can achieve the top grades of Intense and Vivid.” Natural Fancy Color Diamonds are already known as one as one the most extreme rarities in the world today. 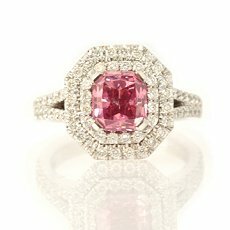 Of the color diamond family, Pink Diamonds are the second to rarest color found; so you can imagine how unique a high quality stone of this color actually is. Pink diamonds are recognized as extremely luxurious items. The increase in rarity together with their popularity has significantly driven pink diamond prices up. Consequently, they are often utilized as additions to investment portfolios as excellent alternative investments. 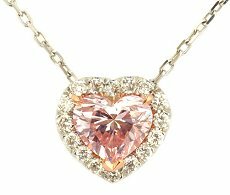 Pink diamonds are considered Type II Diamonds, which are generally more desired by collectors. Learn more about Type I and Type II Diamonds. All diamonds are assessed by the same four main attributes of diamond quality; Color, Cut, Clarity, and Carat Weight. However, unlike white diamonds where the 4Cs are of the same importance, the color of a Fancy Color Diamond is the most significant characteristic of all. Similar to other colors, a pure colored pink diamond without any secondary hue is more valuable. However, as a result of its magnificent appearance, a purplish pink diamond is also considered most preferred. 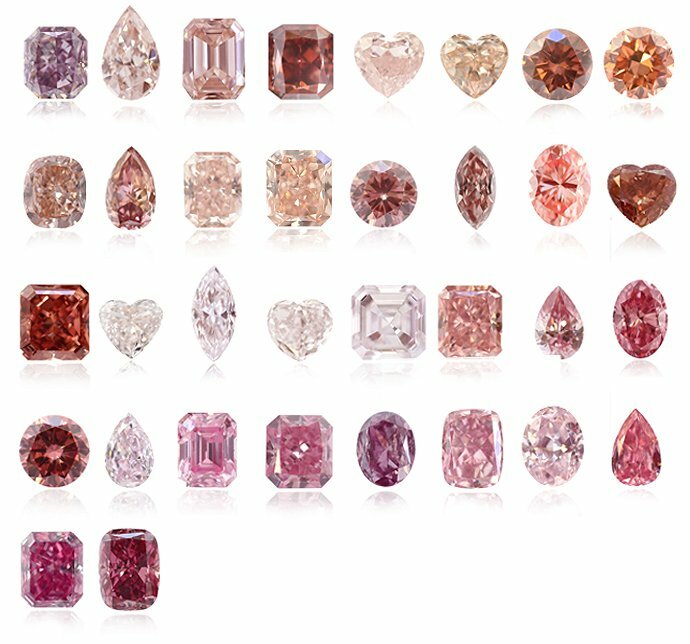 Most pink diamonds in today’s market contain any of the following overtone colors; Purple, Purplish, Brown, Brownish, Grayish, Orangy, Brownish Orangy, and Brownish Purple. 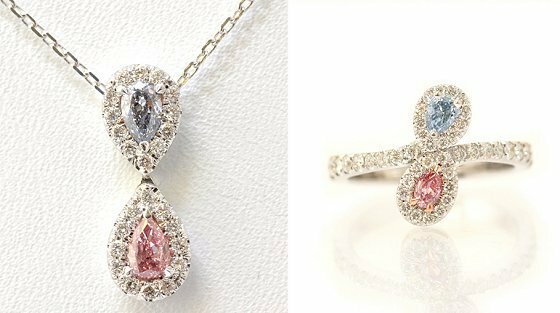 Pink colored diamonds can be found in every intensity grade in the GIA grading scale; Faint, Very Light, Light, Fancy Light, Fancy, Fancy Intense, Fancy Vivid, Fancy Deep and Fancy Dark intensity grades depending on the color combinations within the stone. Pink diamonds are found in a small number of diamond mines throughout the world. However, more than any other, the Argyle Diamond mine has been known as the largest source of high quality pink diamonds. In fact, the coloring of stones found from that mine is so unique that an experienced diamondaires can often identify the origin of the diamond by viewing the stone. The pink coloring of an Argyle pink diamond is so vibrant that Argyle Pink Diamonds, regardless of the size, are considered excellent investments. Read more about the Argyle Diamond Mine. The unique colors in the stones are caused by different trace minerals within the compound elements of the diamonds. Depending on the origin of the stones, meaning where it is from, certain minerals are more present – therefore increasing the presence of specific colors in certain areas. Unlike Yellow Diamonds where the color is caused from large amounts of Nitrogen, Blue Diamonds where the color is caused by Boron, Purple or Violet Diamonds where the colors are caused by increased Hydrogen, or Green Diamonds where the color is caused by exposure to atomic radiation or radioactivity – the cause of the Pink Diamond color actually still remains questionable. 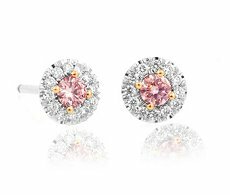 Scientific evidence has shown that Pink Diamonds contain high pressure graining which results in a compressed internal structure and that is thought to be the origin of the color. Within the industry, this is referred to as ‘Plastic Deformation,’ which occurs during the crystal growth. As a result of the increased pressure, it is extremely difficult to find a Pink colored diamond with a high clarity grade. In fact, most Natural Pink Diamonds often contain pink internal graining lines or surface graining lines within the atomic structure of the stones. Although this is a natural defect found in most, but not all, pink diamonds it still can slightly affect the clarity of the diamond – bringing for example from an IF to a VVS1/2. 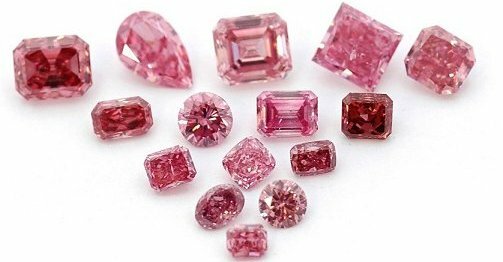 Even with the relatively high prices of pink diamonds, as a result of their exquisite colors, they are often used in various designs of color diamond jewelry. 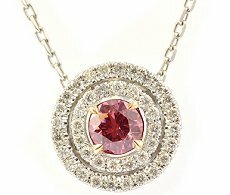 See for example these amazing photos of Pink Diamond Engagement Rings, Pink Diamond Earrings, and Pink Diamond Pendants. 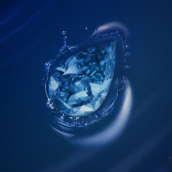 Blue Diamonds are excellent combination stones to be used together with Pink in color diamond jewelry. Below are some great examples with small stones below 0.15ct each that makes for a spectacular item! 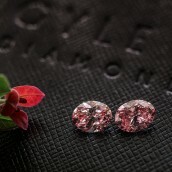 Natural Pink Diamonds have always been seen among the very rich and famous. Even today, many of the Hollywood stars adorn the most glamorous pieces of pink diamond jewelry. Just some of the more famous examples are Ben Affleck who presented an unbelievably gorgeous 6-carat pink diamond ring to Jennifer Lopez. Mariah Carey's Diamond Engagement Ring contains a 10.02-carat Pink emerald-cut diamond, and Penelope Ann Miller was happy to show off her 3.00ct Pink Radiant Diamond Ring at the 2012 Academy Awards. As one of the rarest diamond colors on earth, a number of these diamonds have made quite an impression in the largest and most well known auction houses; Christie's and Sotheby's. A new world record was set for a Jewel sold at auction, when an exquisite and extremely rare 24.78ct pink diamond was sold at Sotheby’s auction house in Geneva on November 16th. The Fancy Intense Pink, Emerald cut stone sold for a whopping $46.16 million dollars! A relatively new record was set for the most expensive diamond ever sold at Christie’s auction house! The 34.65-carat Fancy Intense Pink, Princie Diamond, is now the second most expensive diamond sold at auction, just behind The Graff Pink. 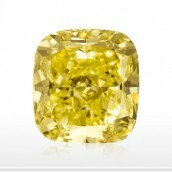 It sold for a fantastic $39,323,750 ($1,135,000 per carat). A 59.60-carat, Oval-shaped diamond of a phenominal Fancy Vivid Pink color with an Internally Flawless (IF) clarity grade. The Steinmetz Pink is one of the finest pink diamonds in the world presently! 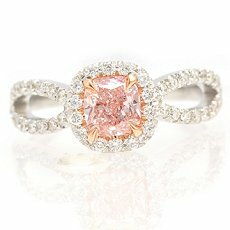 A beautiful 28.15-carat, Fancy Light Pink stone. This cushion-cut diamond has a VS2 clarity grade and a magnificent brilliance. It was bought at auction in 1990 for £4,070,000. For inquiries regarding natural pink diamonds or investing in pink diamonds, contact us at: info@leibish.com. 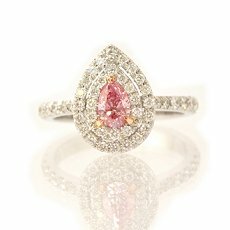 Browse through our wide selection of Natural Fancy Pink Diamonds.